As he was honing his skill as an artist in the early 1950s, Paul Evans (1931 to 1987) attended the Philadelphia Textile Institute in Philadelphia, Pennsylvania; Rochester Institute of Technology School for American Craftsmen in Rochester, New York; and Cranbrook Academy of Art in Bloomfield Hills, Michigan. He then moved to Old Sturbridge Village in Massachusetts where he demonstrated various aspects of silversmithing in a living history museum setting, according to the Michener Art Museum located in Evans’ home state of Pennsylvania. After moving to New Jersey later in the 1950s, he began crafting furniture using his training in metal working and cabinet making. There he shared a showroom with Phillip Lloyd Powell who encouraged his creativity, and the two men continued their partnership for a decade. He moved his business to back home to Pennsylvania in 1970 and employed as many as 85 people during times of peak demand. He opened an additional showroom in New York in the late 1970s. In 1964, he became a designer for Directional Furniture, a contemporary-oriented, North Carolina-based manufacturer (subsequently owned by Tomlinson/Erwin-Lambeth) which produced some of his best-known pieces in several series: Sculpted Bronze, Cityscape, and Argente (the rarest), according to research provided by contributing writer Troy Segal. The popularity of the Brutalist look incorporated into many of these pieces has surged of late. Evans had a unique relationship with Directional Furniture in that he supervised every step of the manufacturing and finishing process, rather than simply supplying a design sketch and turning over the actual manufacture to others. The attention to detail and mastery incorporated into Evans' work represents a crossroad in the field of fine and decorative arts. 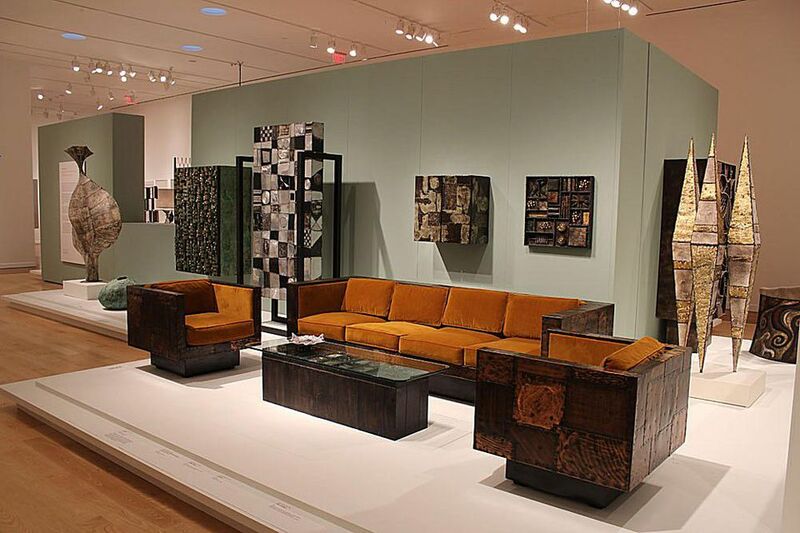 Many of his furniture pieces, which were largely handcrafted either by him or under his direct supervision, look like functional versions of his sculptures held in institutions like New York's Museum of Arts & Design and the Michener Art Museum. Because they're relatively recent in comparison to true antique furniture pieces that have changed hands many times since they were made, Evans designs often have a well-documented provenance. But, it always pays to look for a signature as well: pieces are usually signed either with the initials "PE" or the words "Paul Evans." The Michener Art Museum notes that his custom work also had a two-number date as part of the mark (for example, pieces sold in at Austin Auction Gallery in Austin, Texas in 2010 were signed PE 70 - see below for values). An excellent source for more on Evans is the book One Modern Americana: Studio Furniture From High Craft to High Glam by Todd Merrill and Julie V. Iovine (Rizzoli, $75). As each decade passes, more and more decorative arts enthusiasts with an eye toward modernism are taking note of Paul Evans designs, especially his pieces made by Directional Furniture and his custom pieces from the 1970s. In fact, a Cityscape coffee table appeared on Antiques Roadshow with appraiser John Sollo valuing the piece at $6,000 to 9,000 several years ago. In 2010, an Evans a three-lot dining room set made in 1970 sold collectively at Austin Auction Gallery in Austin, Texas for $59,225, which was more more than double the pre-auction sum estimated for the suite. Palm Beach Modern Auctions also sold a Cityscape cabinet made of chrome-plated metal and mics for $36,000 in January of 2014. What Are Some of the Most Popular Vintage Pyrex Patterns?